Hot musical performances, that?s what patrons can expect to bring the curtain down each evening at BMEX 2007; the Barbados Manufacturer?s flagship exhibition. From 8:30 PM to 9:30 PM the Flamboyant Room at the Sherbourne Conference Centre will come alive each evening as patrons are treated to a musical extravaganza featuring some of the islands leading performers. Coordinator of the entertainment segment, Smokey Burke, has combined artistes from across a variety of genres such as soca, R&B, gospel and calypso to put on shows that will throw patrons into a frenzy, minister to their spiritual side and get them all ready for Crop Over 2007. On the evening of Saturday May 26th, Bajan sensation Kimberly Inniss with her high energy, incredible enthusiasm, and her passion for dance and music will mesmerize the audience in her own unique style. A song writer, producer and musician Kimberly has written all twelve songs on her recently released album ?Come With Me? she has also produced ten of them. Kimberly is best known for her high energy performances and has provided vocals for groups such as Square One and Krosfyah as well as Atlantic recording star Artist Rupee. Sunday evening?s entertainment will be provided by Shane Forrester and his group Instruments of Praise (IOP). IOP has grown to become one of Barbados? leading bands in the entertainment industry. IOP consists of some of the best young local musicians and vocalists and has taken very strongly to the writing and production of its own songs and material. The IOP sound, which started out primarily as jazz/instrumental, has grown to incorporate a strong fusion of varying genres including R&B, Caribbean music, and also some elements of Pop Rock. 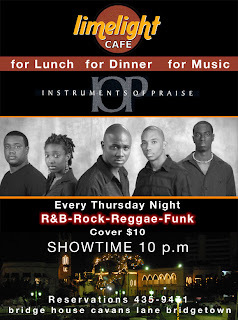 In February 2004, IOP won the award for Gospel Band of the year in Barbados. In October 2004, IOP also copped two awards at the Caribbean Gospel Awards (held in the Bahamas), for Best Instrumental and Best Jazz recording of the year. Outside of the Jazz Festival, IOP has also been involved in all the other major music festivals in Barbados, including The Congaline Music Festival, Crop Over and the Barbados Gospel Fest. On Monday evening the Tone Deaf Family will be on stage. Led by Anderson ?Blood? Armstrong, formerly of Square One, these performers will thrill patrons and send them home in stitches as they take the stage. Performers include Pong with his hits ?Young Ting? and ?ABC Highway? from 2006 and hitting this year with ?Psycho?. Contone who is renown for his ?I Like Drinking Rum?, ?Who Brek My Bottle?, ?2 Sir Grantleys? and ?My Car Brek Down? will also be performing this year?s hit ?Bags O’ Garbage? with ?Who Ready? to be launched this weekend. Other performers include Jiggs and Dawnisha, Mike Levi, Basil, Peach, D2 and DJ Gerald B. Each night the after-fashion show lime will be packed with entertainment so don?t miss it.